Improvement in version 1.5 include enhancement of several tools and small upgrades that simplify application usability. Email module has the greatest improvements, including: mail signatures, file attachments and attaching other types of system objects. Template module was greatly enhanced, enabling users to define template parameters. Drag and drop functionality was introduced to ease moving and copying objects. You can now email attach files or any type of object as a link. You can define a text signature for each account. Autosave email drafts. When writing an email your progress will be periodically saved. Now you can change an object’s workspaces by dragging the object into the workspace panel. You can also apply tags to an object by dragging an object into the tag panel. You have the option to change an event’s, task’s or milestone’s date by dragging it around in the calendar. Change the duration of an event by dragging its bottom edge. Define parameters for a template that you can fill in when creating the objects. Parameters can be text or dates. This allows you to define templates with tasks or milestones whose dates depend on each other. Save events and weblinks across multiple workspaces. Start and due dates of a task are now shown on the calendar. Improved user selection interfaces to select subscribers. Recurrent tasks. Allows you to define tasks that need to be done periodically. Administrators now set the default value for user preferences. 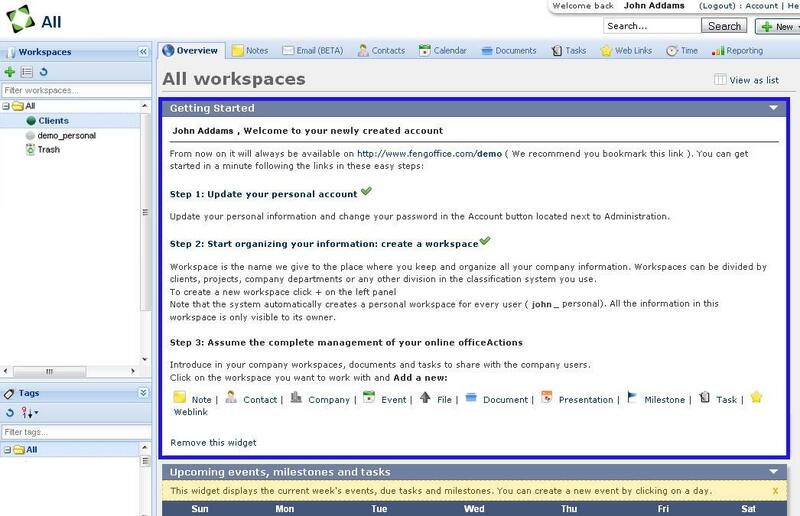 Group permissions were improved, now you can define permissions for groups per workspace. Password requirement to access the Administration panel. Users IP address are logged when they log in. The features introduced in this version increase the suite’s flexibility to adapt to several business scenarios, allowing managers to include custom properties on every system. Version 1.4 also presents a new integrated “contextual help” system to guide new users. Help is now introduced in small, contextual text boxes (guidance widgets) that can be closed by the users after they learn the concepts it explains. 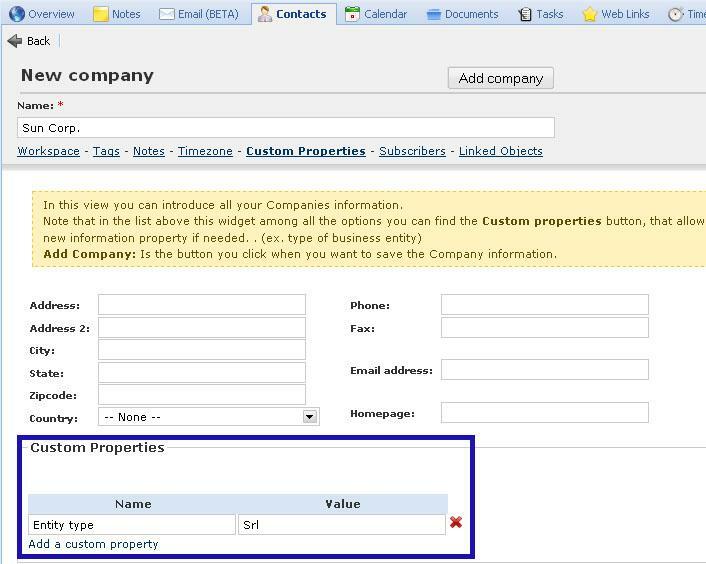 You can now define custom fields for an object type (Note, Company, Document, etc.). Define the fields’ type (text, number, date, list, boolean) and other aspects like marking it as mandatory data, or defining its possible values. Custom properties allow you to adapt OpenGoo to your business requirements. Create custom reports based on an object type. Define conditions and parameters for the report. Now you can execute it whenever you want and optionally print it. Useful to gather relevant object information in a report sheet. Contextual help throughout the application explains how to use different functionalities. New “Getting started” widget shows how to start using OpenGoo by following four easy steps. Useful to help and guide new users, and can be easily hidden by advanced users. Email notifications improved: more information is now shown, using the recipient’s language. — Notifications can be sent asynchronously through a cron process. Add references to external documents via URLs as files in OpenGoo. Document previews can be expanded to fill the whole page for easier viewing. Timezones are now handled correctly.